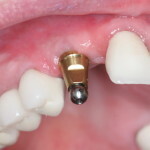 Dental implant abutment (middle) connects the titanium post and porcelain crown. This article outlines the information you need to bring to your dentist in Mexico in order to restore your dental implant post with an abutment and porcelain crown. 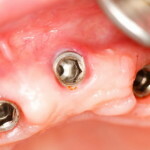 Are you planning to go to Mexico for an affordable crown on your dental implant? If you are like many people, you already had your dental implant titanium post installed locally by your American or Canadian oral surgeon or periodontist. 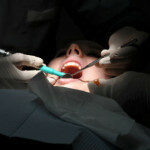 The dental post has fully healed from the dental surgery, and you are ready to finish your tooth replacement. Given the high cost of continuing the dental work locally, you are weighing the option to travel south of the border such as Tijuana, Mexico for a cheaper porcelain crown. Before you drive to see a Tijuana dentist, you can save yourself an extra trip by knowing about implant abutments. Most tooth replacements using dental implant have 3 components: titanium post, abutment, and porcelain crown. 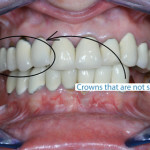 The abutment is what connects the dental post to the porcelain crown (shown in the single tooth replacement image above). Without the proper dental abutment, your dentist in Mexico can’t take impressions for the porcelain crown. Although more expensive, you have the option of asking your local implant specialist to install the abutment before you travel to Mexico. To save money, your Tijuana dentist can also order and install the corresponding abutment based on the specifications of your dental implant. 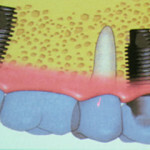 Each dental implant and abutment has different measurements and manufacturers. Just like a nut and a bolt, your implant post and abutment have to match to have a successful dental tooth replacement. Your dentist in Tijuana would have a hard time restoring your dental implant post without ordering the proper dental abutment for your specific dental implant post. Hence, before you travel to Mexico for a more affordable dental abutment and porcelain crown, you need to obtain the specification of your dental implant post from your local implant dentist. You need to present this information to your Tijuana dentist so he can order the proper size or type of abutment. Teeth implant post come in different diameters, measured in millimeters (mm). Teeth implant posts have different lengths, measured in millimeters (mm). 3. Internal Hex or External Hex? Is the implant internal or external? Many top dental implant manufacturers produce both internal hex and external hex configuration for dental implant posts. Your dentist can also give you a manufacturer’s product code that can identify this information for you. Which brand of implant did your dentist use? If you went to see a good implant dentist, he would have used a well-known and reputable brand of dental implant. Dentists in Mexico can easily order dental abutments from leading brands of dental implants. Tooth 18: Zimmer (TSVWB10) 4.7 mm x 10 mm. In this case, the implant post length is 10 mm, the implant diameter is 4.7 mm, TSVWB10 is the product code, and the manufacturer is Zimmer. One last thing, you need to be very accurate when obtaining information about your dental implant. I suggest requesting the information above in writing (such as email) from your local dentist. Why? These abutments are ordered in sterile packages. A dentist can’t reuse dental abutments on another person once he tries it once with anyone. Even though dental abutments are more affordable from a dentist in Tijuana, you don’t want to get stuck with the bill paying for incorrect size abutments already ordered by the dentist. The dentist may charge you for the wrong abutments he can’t use. By knowing specifics about your dental implant post, you can go prepared for your implant crown consultation with your Mexico dentist. 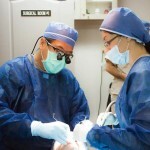 He can provide you the exact cost of the dental abutment in Mexico. You can even save a trip if he has the dental abutment type handy or if he can order them overnight. Now I believe you are one step ahead of dental tourism travelers. Have a safe trip! Call Dayo Dental at 877-987-3296 for affordable dental implant abutments and crown from the best dentists in Mexico.